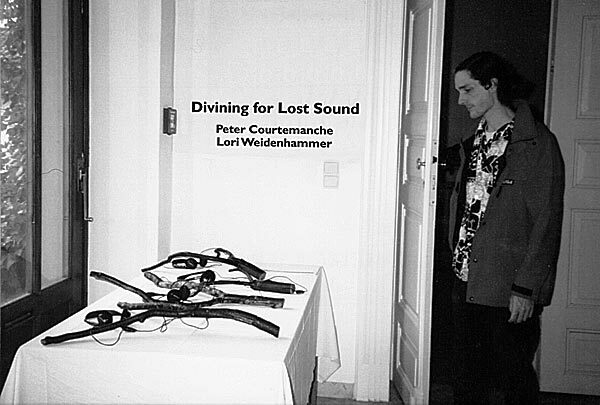 by Absolute Value of Noise and Lori Weidenhammer © 1996. 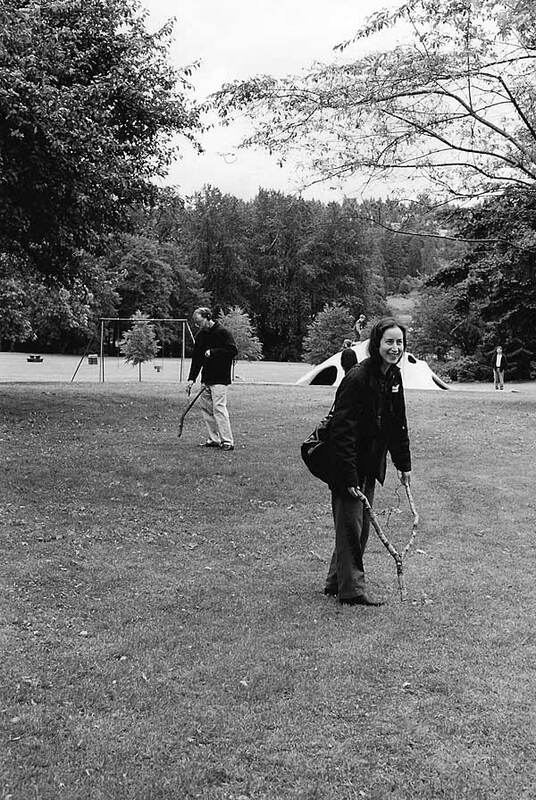 Divining for Lost Sound is an outdoor sound installation. The piece is based around the metaphor of divining, the art of finding objects, minerals or water underground. 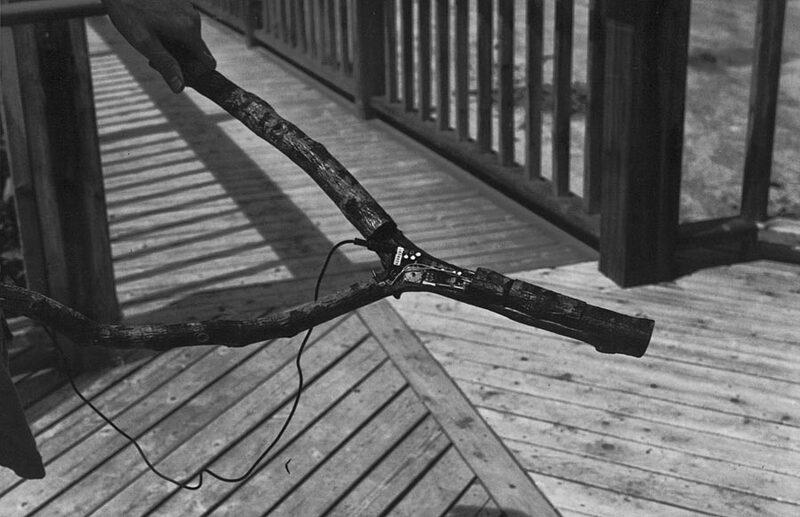 The traditional divining rod is predicated on the philosophy that sympathetic vibrations exist in the earth and in the dowser. These vibrations can be focused so that they resonate and provide a guide to what lies within the earth. 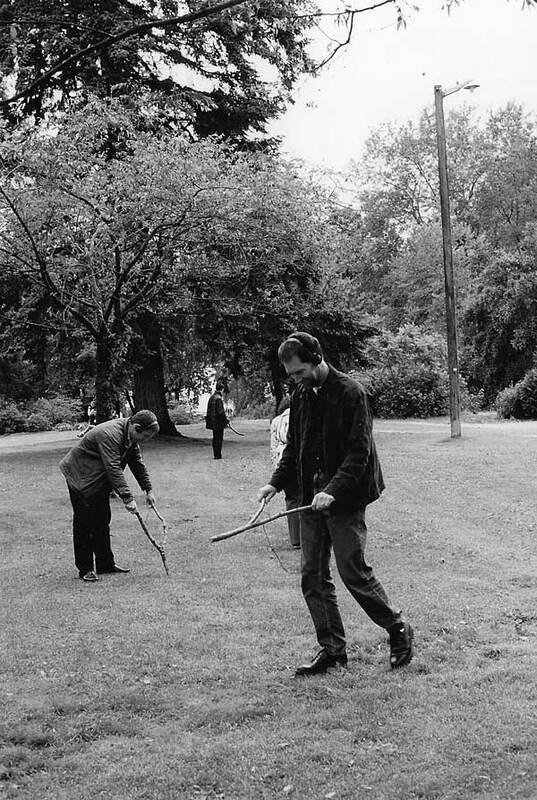 Divining for Lost Sound connects contemporary electronic technology in the form of radio waves and electro-magnetic fields with this ancient technique of dowsing. The piece attempts to bridge time. It places the audience in the role of the dowser - a venerable and timeless tradition - while connecting them to sounds that place them in the past. These sounds are like ghosts telling stories through song, weather, and whispers. Copper antennae - buried under the earth - are used to detect the presence or proximity of the listener. The antennae become a metaphor for a virtual stream - the diviner's treasure. The antennae create an electromagnetic field that surrounds the participants. This field reacts to the presence of the diviner and responds by transmitting an audio signal that can be heard on a portable radio receiver. As the participant approaches the antenna the clarity of the sound source improves. At a distance of several feet or more, the sound becomes obscured by static, but within a few feet of the antennae the audio is clear. This change in clarity helps to guide the participant along the path of the electronic water. Divining for Lost Sound was designed to be site specific, adaptable to the context of each location where the work is presented. In June and July of 1997, the work was installed at the St. Norbert Arts and Cultural Centre, the site of a former Trappist monastery, in Manitoba. The background of the ruins provided the basis for a sound-score that evoked the history and solitude of the site. Chanting monks were juxtaposed with the songs of local birds, the sounds of storms and fires that had ravaged the monastery, and poetic/electronic treatments of daily life and the choral tradition that is an important part of monastic culture. The work created a space for a romantic reflection of monastic simplicity mediated by the electronic divining rod. The sound score for the piece consists of three interwoven histories: the daily routine of the monks, the history of the monastery at St. Norbert, and the beginnings of the Trappist movement in Canada. The title of the piece, the great silence, refers to the waking hours in the monastery, a time of communion and prayer. The daily routine of the monks involves eight choral offices. Some monasteries practice additional "little offices", silent prayers, and readings. Interwoven with the choirs are the chores of daily life: making beds, breakfast, dish washing; and several hours of manual labour: farming, building, making cheese and other products. The sound score is based on the notion of living in silence. The daily lives and history of the monks is explored in terms of the sounds of their existence - sounds without conversation or other forms of "non essential" personal communication. Early in the morning, we hear the monks rise and move through the monastery on their way to choir. In the score, the choirs are explored through a re-creation of authentic chants and prayers, devices of electronic music, and the connection between song and spiritualism. The daily routine is blended with the sounds of larger moments in history - catastrophes (fire, flooding, storms), changes to the rule of silence in 1967, and the relocation of Notre Dame des Prairies in 1978. An excerpt from "the great silence" (1997) composed and produced by Peter Courtemanche. Binaurals: P.C. and Lori Weidenhammer. Voice of maris: L.W.. Choir: Ian C. H. Bullen, Derek Christian, Andy Hillhouse, Michael Murray. Tape improvs: P.C. The radio-divining rod at SNACC. Summer 1997. In July and August 1998, the piece travelled to Bregenz, Austria as part of Kunst in der Stadt 2, a festival of sound-art in public spaces. The organisers of this festival had a particular interest in archival material. For this installation, the radio-interaction was used as a metaphor to explore a selection of works that reflected the artists' interest and involvement in the sound-art community from the 1980's to the present. 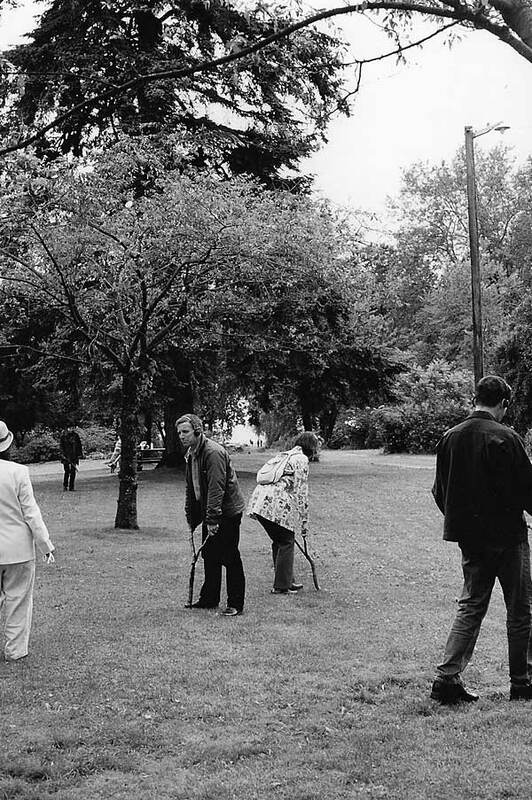 It was a journal - a document of meeting points between the artists and their collaborators. The Bregenz score interwove parts of the original "great silence" score from St. Norbert with excerpts from the composer's radio archives. This included material from the "Absolute Value of Noise", "Private Radio", and more recent soundtrack work. 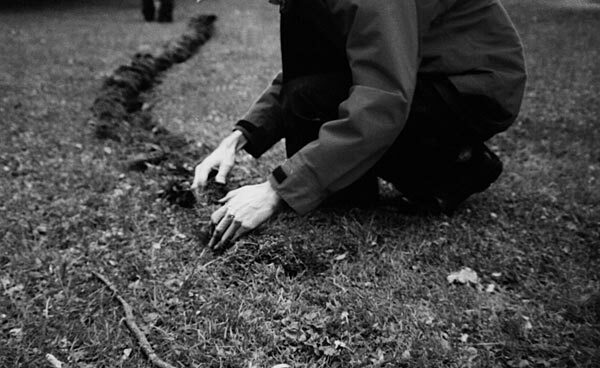 Planting the antenna in Bregenz, 1998. There are two threads to this piece: a story describing a seance, and the imagined daily life of Grace Ceperley. The story describes the seance in terms of sounds. It is written in the style of such texts from the 1920's and 30's. The setting, props, and reactions are based on reasearch into the Spiritualist movement - most notably, the T.G. Hamilton Collection at the University of Manitoba, and various documents on the subject from the 20's to the 60's. T.G. Hamilton was a researcher who photographed seances in a laboratory setting during the 30's. One of the most interesting things about his collection are his hand written notes which accompany the photographs. These notes recognize the often staged look of the photographs while at the same time providing an explanation for these apparent tricks. Strings that run from the medium to noise making devices are said to be pulled by the spirit that moves through the medium. Ectoplasm is said to condense into forms that resembles cheese cloth and silk. Interwoven with the story of the seance are sounds from the imagined daily life of Grace Ceperley - who is said to haunt the building to this day. This includes the sounds of musical gatherings, teas, servants running down stairs, etc. The trappings of spiritualism are evoked through mention of spirit cabinets, bells, rapping devices, and unearthly contact with the spirit world.